A bubbling, slightly twisted blend of The Mighty Boosh, House of Pain and James Joyce. Call it stream-of-consciousness, messy art-house disco funk comedy. A two-woman character sketch comedy bonanza. 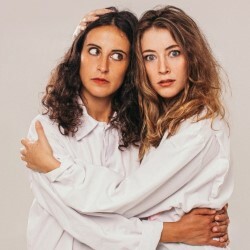 These ‘improvising geniuses’ (FunnyWomen.com) guarantee a kaleidoscopic adventure of surreal proportions. ‘Sensual, spiritual, baffling, staggering… hilariously unpredictable’ ***** (ThreeWeeks). Meet ‘The Mighty Boosh on acid’ ***** (BroadwayBaby.com) and the female duo ‘redefining live comedy’ (Vice.com). Róisín and Chiara’s lightning-paced, rhapsodic storytelling, told in uncanny synchronicity, brings to life a plethora of irresistibly well-observed character vignettes unlike anything else on the scene.